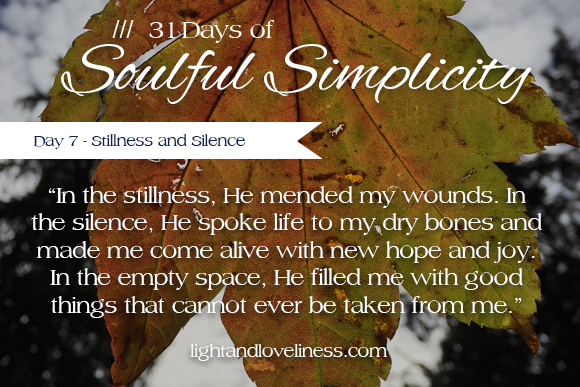 This is day 7 of Soulful Simplicity, a 31-day series through the month of October! If you missed the first week of the series, you can check it out here. Thanks for taking the time to spend a few minutes here. There was a time that I was very uncomfortable with silence. Anytime there was an open space in my day without noise, I would franticly rush around to figure out how to fill it. I could turn the tv on. Flip on some music. Call a friend on the phone. Call another friend on the phone. Anything to rescue me from the cavernous loneliness I felt when there was an open, unfilled space and I might have no other choice but to face heartaches I was not ready to fully engage. Anything to keep me from falling into the black abyss of fear feeling anxious thoughts and having to be honest with myself about how much I distrusted the goodness and love of God for me. Anything to put my attention on a task or pursuit that I felt would prove my worth, usefulness, knowledge, or give me the feeling that I was in control of everything in my life. I craved noise, momentum, forward progress because I couldn’t bear quiet, stillness, or the very real-to-me possibility that if I engaged my heartaches honestly, I might never recover from the trauma of it. Due to circumstances outside of my control, I found myself living in a new state, as a new young first-time mom, married to a husband pre-occupied with starting grad school and no personal contacts to speak of. My firstborn daughter was a month old, and I was alone with her for hours a day while she slept in her bassinet in our mostly-bare third-floor apartment that contained only a few hand-me-down furnishings from our college lives. There was one extra tall pine tree in our entire complex, and it happened to be right outside my living room—reminding me of my pacific northwest roots, the eternal Los Angeles sun shining warmly through its branches. Simple times, they were. It was as if God moved the pieces of my life around in such a way that I could not escape the silence, could not run from His invitation to be still and quiet and discover a whole new way of living that (I didn’t know at the time) would bring about the most radical healing within me that I could ever have imagined. It was there that He invited me to discover how wide, deep, and great His love is. It was there that I first heard Him whisper desperately-needed peace to my soul. In the stillness, He mended my wounds. In the silence, He spoke life to my dry bones and made me come alive with new hope and new joy. In the empty space, He filled me with good things that cannot ever be taken from me. In my surrender to His will, He refashioned my perspective of what it means to live well, to live for a purpose beyond myself, and to embrace the miracles He wants to do in my life. *Special thanks to Lea Turner for featuring my essay about perspective on her blog today. Emily! Thank you for sharing. As I read, I was reminded of our conversations in your L.A. apartment. I will forever be grateful for those times together. I crave silence these days since my 2 littles are constantly talking, yelling, or singing. Ha! I am also learning how to still the voice in my head. To let that be a place of quiet too. Just yesterday I was reading through Celebration of Discipline by Richard Foster. If you don’t already have it I think you would enjoy it. I crave silence too, Franci! It is a bustling zoo over here so much of the time! I do love Richard Foster, but I am partial to his Freedom of Simplicity book (the very book that changed my life about 9 years ago when I first moved to L.A.)…Miss you, friend! I miss the din of children’s lives now that I am back East & alone. But the freedom of my own life is good ? too! Alone-ness is familiar. I’m grateful for church. I’m grateful for volunteering and contact with friends. I’m grateful for social media and news of others. I listen to Christian radio and enjoy music & audiobooks. You have such a heart ❤️ for going deeper. Thanks for your post! Hugs Judy! Thanks for reading along.